We are committed towards offering wide assortment of Steel Shot of sizes ranging from 0.18 mm to 2.00 mm. The offered shots are sourced from authentic vendors in the market and are made up of finest grade molten steel. We offer these shots in safe packaging material in order to avoid physical damages in transit. 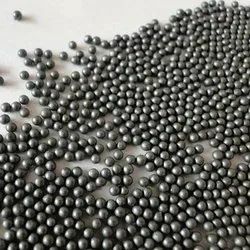 We offer our clients with a comprehensive range of Spherical Steel Shot. These are procured from reputed manufacturers and checked on various quality parameters. Our range is in accordance with the prevailing international quality standards and offered at competitive prices. 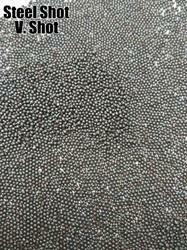 Available Sizes 0.3mm - 6.6mm. 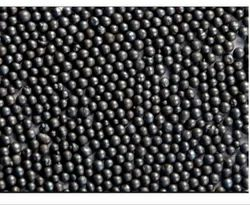 Steel Shot Peening Media offered comprises variations including Cast Steel Shot and Steel Cut Wire Shot that are designed to bring reduction in shot blasting machine wear & tear as well as at the same time also reduce diameter by 'peeling off.' Some of the areas where these are preferably used include for de-flashing, de-scaling, de-burring and shot peening applications that are performed on components made of steel. Keeping the isolated and changing requests of our clients in perspective, we as a prime unrivaled exporter, manufacturer, wholesaler/distributor, supplier, and dealer are enjoyed introducing a wide accumulation of Round Steel Shots to our clients. Fabricated under the bearing of our sellers utilizing premium quality material, the whole accumulation is broadly certify and recognized for its completion and simple to utilize Features. Other than this, our array of Round Steel Shots is accessible at business sector driving rates.